I can’t really say I’m the biggest fan of the late film maker Tony Scott. His filmography is a bit of a mixed bag for me. I can’t get into movies like Top Gun or Déjà Vu no matter how hard I try, but on the other hand Domino is a highly underrated action film and True Romance might even be one of my favorites. Like I said, it’s a mixed bag. 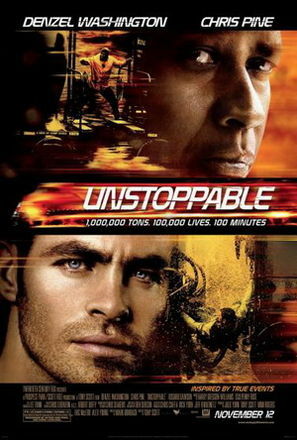 Scott released his last film in 2010 titled Unstoppable, and it kind of serves as an exclamation point for the run on sentence that is Scott’s body of work. It has that signature frenetic style that everyone will recognize, but it also has a really interesting plot based on true events and some good characters to keep that story going. I was kind of surprised by it. 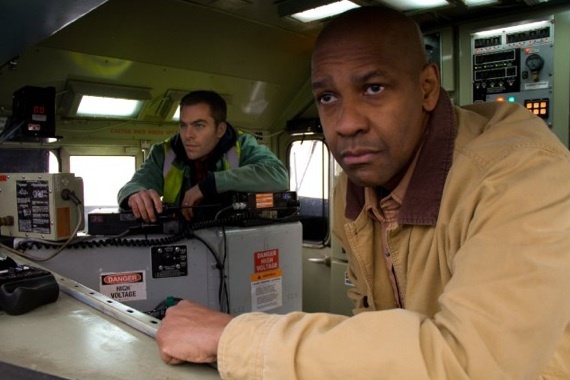 Will Colson (Chris Pine) is a new train conductor assigned to veteran engineer Frank Barnes’ (Denzel Washington) train scheduled to make stops in a number of small Pennsylvania towns. All in all, it sounds like a pretty mundane day for the two railroad workers. What they don’t know is that further up north, a completely inept hostler has lost control of a half mile long train that has cars containing a highly toxic substance called phenol. Now this train is barreling through towns without any control and is a risk of derailing at any moment and releasing this substance that could poison an entire town. Yardmaster Connie Hooper (Rosario Dawson) rounds up her usual employees to stop the train, but corporate interference is making the task almost impossible. With time running out, Colson and Barnes decide to catch up to the train and slow it down themselves. With Hooper giving directions back at the train yard, the two railroaders push their train to the limit to stop a massive potential disaster. Going into this movie, I wasn’t really expecting too much. Every time I asked someone about Unstoppable or it was brought up in conversation, no one ever seemed to excited about it. I’m really glad that these unremarkable responses didn’t deter me from actually watching it and formulating my own opinion. This is a well paced, well directed, and well acted film that, along with Domino, is a highly underrated Tony Scott movie. The plot takes its time in many places and that’s a smart choice because a movie like this could easily be rushed and contain non stop action. The first half hour or so sets up the characters and the setting while also giving the audience enough information to be able to follow the story. I really don’t know much about trains or how they work, so without this set up, I would have been completely lost during some of the more technical discussions. So, just because the action doesn’t start right away doesn’t mean it’s boring. Scott’s visual style and direction always keeps things interesting until the real meat and bones of the story begin. When the action does get started, it rarely ever lets up. This is an incredibly fast paced movie that, like I said, doesn’t feel rushed. This is where Tony Scott’s direction really shines. For one thing, most of the crazy stuff that happens was all shot with very little CGI. Instead, Scott opted to go with stuntmen, real trains, and lots of disposable things for the trains to crash into. This is a great looking movie for reasons like that, and also Scott’s kinetic and highly saturated visuals. The way the action is laid out also gives the tension and thrills time to build up. When the train is first lost and out of control, it isn’t moving too fast. By the time the climax of the movie happens, however, it’s traveling nearly 80 miles per hour with all of those other train cars, some of which contain a highly toxic and combustible chemical. This is one of those movies where you’ll find yourself slowly inching to the edge of your seat and letting out those wonderful sighs of relief. Amidst all the mayhem with the trains, there’s also a story of corporate interference and disrespect for all of the people working in the field and not operating out of a boardroom on the fiftieth floor. This isn’t a subject that’s often shied away from, because a lot of working people can relate to it, but Unstoppable handles it in a way that resonated with me well. A lot of it has to do with the surprisingly three dimensional characters. Washington’s character is the veteran who’s getting screwed over by the company, Pine’s character is just getting into the company that’s obviously flawed, and Dawson’s character is the person who has made somewhat of a name for herself, but still isn’t respected by the higher ups. It really all of the bits and pieces of a company from the completely inept employees to the veterans just trying to finish their time on the job. Unstoppable isn’t going to go down as an action classic in the years to come, but not every movie has to have that kind of status. This is a very well put together action thriller with fully realized character and plenty of mayhem and destruction to keep your eyes glued to the screen. I wouldn’t call this movie great, but it’s certainly really good and epitomizes most of what made Tony Scott’s vision so unique. This one’s worth checking out.